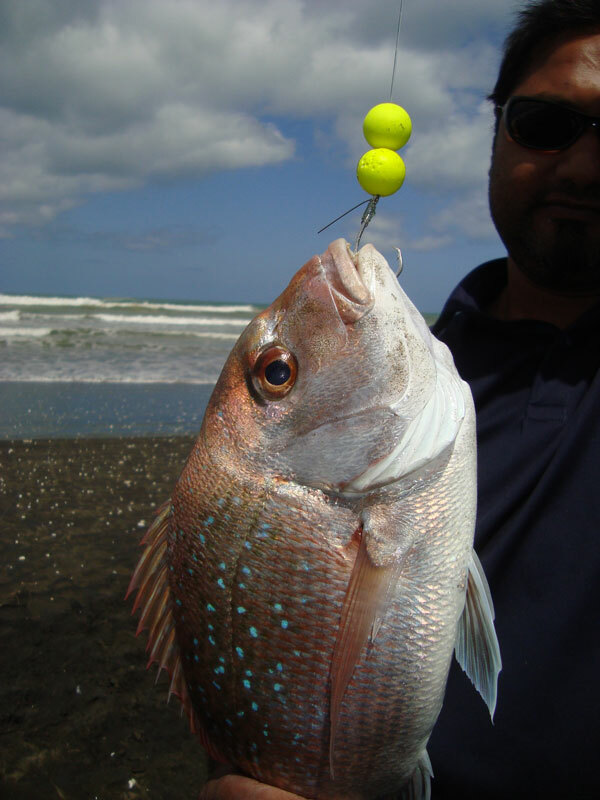 On Sunday January 9th I headed to Muriwai Beach with Varsha, Vinnie and Lee to show them how easy it is to kitefish. The winds started off light with around 10 knots SE with the occasional gust to 15 knots. I made the decision, with the winds the way they were, to use the 50kg dropper with the Power Chute Kite. This is a powerful downwind sled kite, smaller than our largest, most powerful Mega Mouth Kite The Power Chute kite has a sail area of one square metre and fishes winds of 5 to 30 knots with ease. 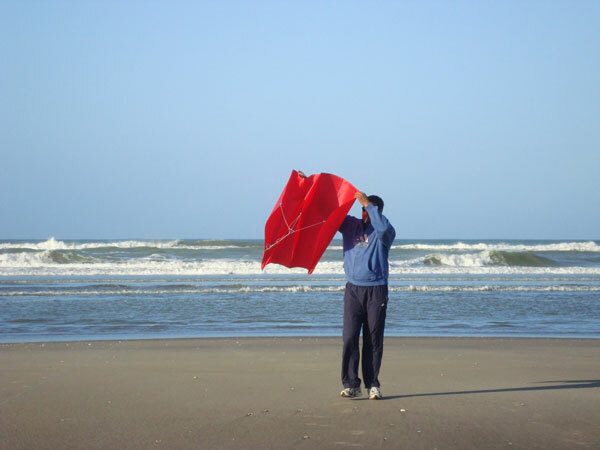 With such fickle winds Vinnie took the kite and walked down to the waters edge. He lightly held the kite up to catch as much wind as possible and then I wound the line back in on the 3 to 1 ratio beach reel. (We call this a Power Launch). The speed of the reel retrieval is much faster than anyone could run and makes launching in light winds a breeze! After just a few turns of the reel handle the kite was airborne and heading offshore. I attached the dropper line while Vinnie and Lee looked skyward in amazement having never seen kitefishing before, the kite had bitten into the higher winds found at altitude. Then as we let the kite up even higher and lift the dropper line the winds increased to closer to 20 knots and as the flag and bottle cord powered off the handspool I realized that the bottle float was now very much underweighted. Despite having a full two litre bottle of water, plus a little bit of sand, more weight was needed. The bottle was retrieved and more sand was added so the kite couldn’t lift it off the beach. Ten traces were set with a combination of standard 5/0 Sea Guard Target Traces and our new 20mm Fluro Yellow Double Bead Target Traces. We baited up with fresh mullet and Lolligo Squid. This squid by the way is clean, super fresh, snap frozen, pure white, and one of the best baits going. Once the Power Chute dropper rig was set, I then moved on to one of my favourite kite rigs, a Flexiwing dropper rig that sets from a Penn Senator 9/0 spooled with 1100 metres of 80lb PFK Spectra. The winds then dropped away dramatically and after several attempts to launch the flexiwing kite I decided not to set this particular rig today but still ran through the set up and launching techniques with the guys, in the meantime the powerchute just carried on flying through all the lulls. The first set of the day was run out to just behind the back breakers and left to fish for 35 minutes. This set produced one decent pan sized snapper and one small kahawai. The second set was put out further to around 600 metres offshore in hopes of finding more fish. Unfortunately this set returned no fish and all baits were still intact. The third set went out the full 1000 metres and returned two large gurnard. By this stage the tide was turning and we decided to stay on and fish over the tide and head back down the beach on the next outgoing tide. Two more sets were done and the only other fish to be caught on the day was one very fat but short stingray. Rob Nelson from Paul’s Fishing Kites was also fishing Muriwai that day, and he also reported very poor catches, this made me feel a lot better about our smallish haul of fish. During the week it became apparent from reports from others fishing Muriwai that fishing was very hard that day as all had similar stories. Not enough fish were caught on the day to really get an accurate sample, but at this stage it may pay to point out that all fish taken from my dropper rig were caught on the Lolligo Squid on Yellow Double Bead Traces. I’ll trial again soon and let you know how I get on. NOTE: Primo fresh frozen clean white Lolligo Squid Baits is the best frozen bait around, we have it instore now in free flow 2kg packs for $25.00 each. Keep your baits up off the bottom and attract fish to your gear with these larger and more buoyant floating beads. Also available on pre-tied Target Traces. Packs of Five Single Bead Traces for $18.00 or Double Bead Traces for $20.00. Hi Peggy, Please let the team know what a great product you have in the 65kg Dropper Rig. I purchased the rig on a Saturday morning, my brother and i took it to Glinks Gully the next day. On our very first 10 hook set with just the Nighthawk Kite, (it was nice and windy), we pulled in a nice 37cm snapper and three kahawai. The kite and rig are so easy to use and performed better than we ever expected. We fished while the guy down the beach with a torpedo spent the afternoon retrieving it from the surf and untangling his line because of the strong rip. It didn't affect us, we had a ball!. No camera unfortunately, but we're still learning. So thanks for the great advice I got on Saturday. Can't wait to get back out fishing. The above photo is a nice result from 50 minutes on the water using octopus for bait on my Paul’s Fishing Kites Kayak Longline. 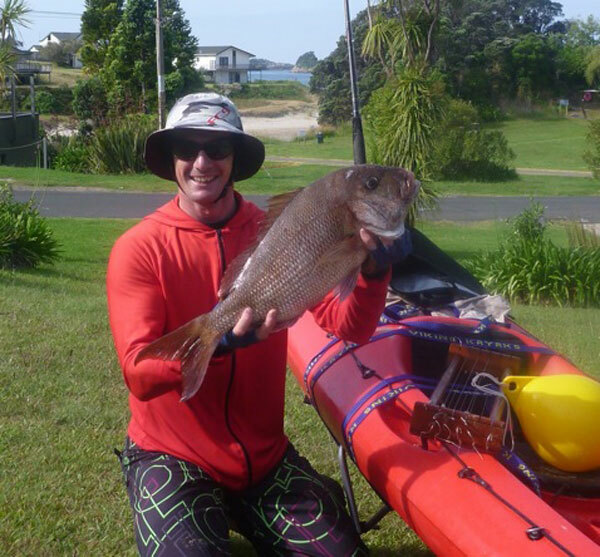 I have posted some info regarding the kayak longline on my website including a snapper & crayfish video you may want to watch, also see the articles page for the long line article, it's a new website and this is my first article. Hi. 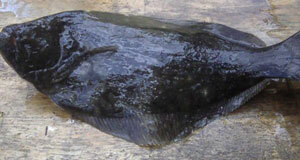 After getting a second set of Flounder Gigging Lights from you recently, this is what we caught. 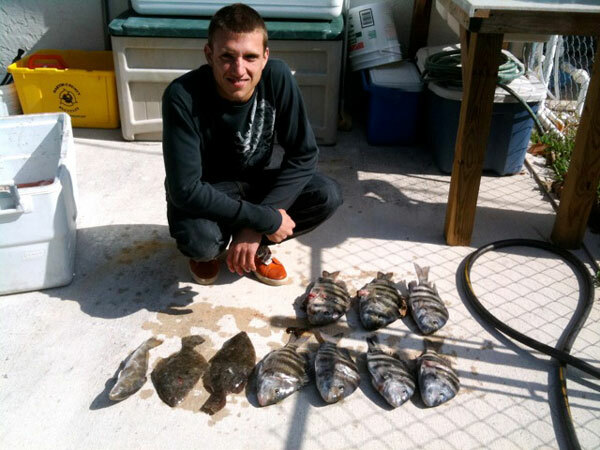 The fish with stripes are called sheepshead, and the one other fish beside the flounder is a croaker. We were only out for 3 to 4 hours. We have two sets of the lights so we fished with two gigs. It was a good first trip! I’ve used your flounder lights before and they are the best! In response to a question from Peggy about how big the flounder get in North Carolina a customer sent in the following details of one he got a few years ago. I don't know the lengthof this big flounder although it is probably about 25 inches long, the tackle shop weighed it at 10.4 pounds. Up here we call these "Door Mats"
We got nine that night. There was a limit of eight per person and a 14 inch minimum size limit at the time. 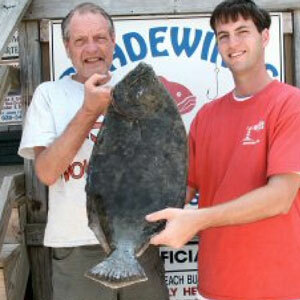 We took this fish and the others on the Outer Banks of North Carolina in Pamlico Sound which is near Hatteras. We walk and gig and sometimes the water is quite murky. I just want to say thank you for the flounder gigging lights. I got them yesterday went floundering last night. It was great and I gigged seven big big flounders in 30 minutes. I had never gigged before but with the two lights I felt like a pro! Thank you very much. 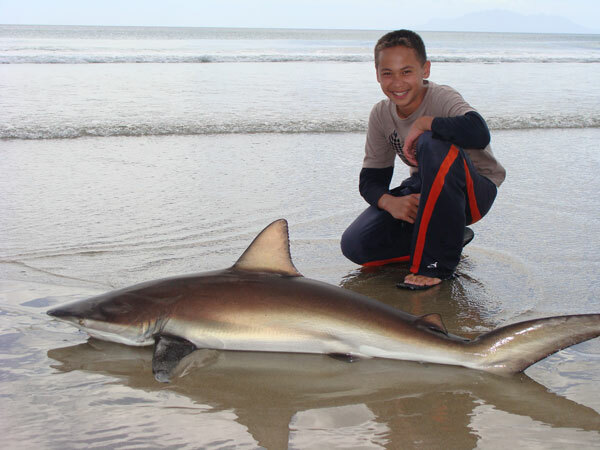 Hi All, There was a ten foot White Pointer shark caught up in a bait net off Tinopai (Kaipara) in the last week or so and apparently this happened before about two years ago. The first one was about 12-14 feet long. My concern is that there is a platform for local kids to swim to about 100-140 metres off shore, looks like an anchored barge, a pontoon if you like. Nasty. Not quite Jaws stuff but I’m damn sure I ain’t going in the water. Kids every day swim to and from the pontoon and the net was set on the inside of the pontoon 30 metres toward shore. 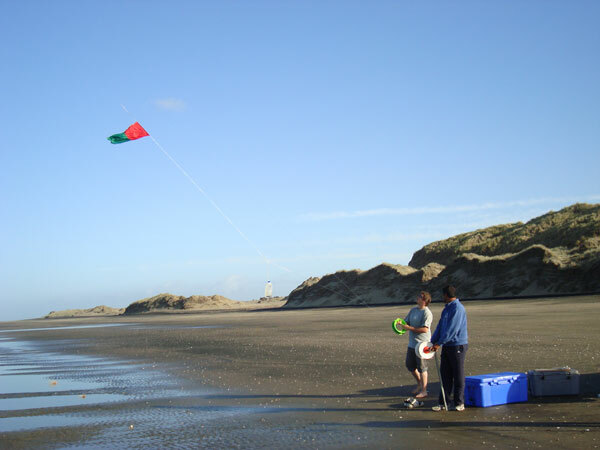 Just to let you know, we went kite fishing at Pakiri beach last 1st of Jan 2011 and were using a Flexiwing Kite Rig bought from your store. On that day, we managed to catch this huge shark. Ed: You did well to land this on a flexiwing rig as bronze whalers of this size can put up a huge fight. The Kontiki guys need to take note and keep their sets short and baits small as sharks of this size can easily sever a mainline. A must have for fishers on the go, campers, backpackers, motorcyclists or for anyone short on space. Sturdy and strong design made to fit all PFK Three to One Ratio beach reels. Supplied with two screws and wing-nuts, simply assemble and disassemble on the spot when needed. We’re restructuring our company. Come in store and check out our HUGE specials. ALL dive gear must go! ALL Big Game lures must be sold! SAVE UP TO 50% Be in quick, once it’s gone, it’s gone. We will not be replacing this stock. 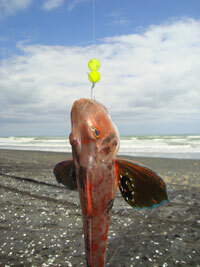 I want to alert you all to a proposal on Orewa Beach, that will stop kite fishing there.. There is a Resource Consent Application going into the ARC, to build an artificial reef offshore. It is the same as the one built at Mt Maunganui, a large fabric bag filled with sand. The application was return to the applicant this month, due to lack of detail, but will no doubt be sent in again soon. I have my own reasons for objecting to the reef, which relate to engineering issues etc, but would appreciate your members watching out for the notification, and objecting to it as well. 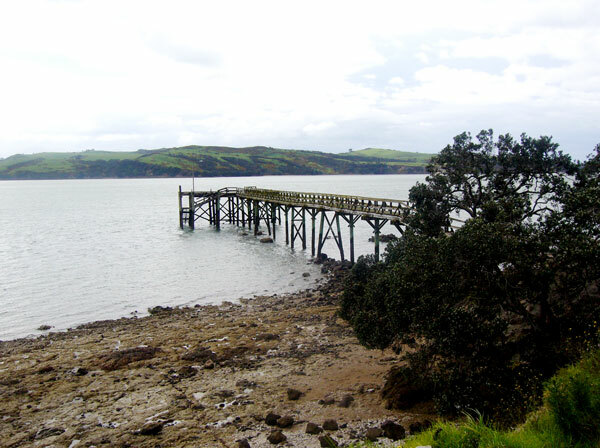 I am an independent Commissioner and often act as the Minister of Conservation's representative, on Resource Consent Applications, relating to foreshore work. The Consulting Group 2006 Ltd.